I read this article and found it very interesting, thought it might be something for you. The article is called White Evangelical Support for Trump comes from Churchgoers, not EINOs and is located at https://thewitnessbcc.com/white-evangelical-support-for-trump-comes-from-churchgoers-not-einos/. This article was first published on the Religion News site. It was reposted here with permission. @Toviyah, yeah, I can honestly say I did. Really, from the perspective of personal characteristics, I have more respect for President Obama than President Trump. On a personal level, I was excited to finally see a person of color in the office of President. I didn’t support every decision, but I didn’t disagree with every decision either. But all that had no bearing on what I posted previously. Those commands are in effect regardless. no apology necessary! i did take it a little on the negative side, but it was no biggie. i also would like for you to know that i get ‘a lot’ of backlash from fellow african americans. i cannot and will not agree with anything that is not in line with scripture. my thing is you have to compare every situation to JESUS CHRIST AND HIS WORD. yes, the judicial system in this country is for white people. that’s a fact. and when there injustices done, there are avenues which can be used to try and get justice done. but when those avenues don’t work, we need to move on. and the ‘only’ way to be able to do that is through the HOLY SPIRIT, the 3rd PERSON OF THE TRINITY. so, as a lot of African americans look to ‘white america’ for acceptance, i look to CHRIST. no one white or black ‘died’ for me. CHRIST is my SAVIOR. i have to please HIM, not any white person. and definitely not for this ‘country’. i don’t salute the flag, and i don’t salute people. THAT’S idolatry, any way you look at it. i don’t love this country, it’s not (my) home. i love and salute my (precious) SAVIOR JESUS CHRIST. well mark i know i kind of got caught up, but………………….. no apology was needed. in your future, i hope you get to the book i suggested to you. Honesty is a distinctly christian trait. With that in mind, can you honestly say you prayed for President Barak Obama during his 8 years as the leader of this country? I apologize for my inaccuracy on the length of time you have been in a white reformed church. You have great patience and perseverance. I’m sorry you took my previous reply to be negative. Please keep on doing what you do for the sake of the Gospel. As I said previously white evangelicals need to hear and listen to what our black brothers and sisters have to say on issues of oppression, injustice and racism. Thank you for the book recommendation. I’m currently reading “The Color of Compromise” but I will look up “One Nation Under God”. your response said 7 months, i said 7 years. and believe me, i’m not generalizing all reformed as such no more than (all) african americans being blamed for most of the crime in this country. when i don’t agree with what the mindset of my fellow christians believe, believe me, i try to talk about it, i compare it to ‘scripture’ and bring it to attention, and that mindset stays in place. when you talk about this country, the ‘truth’ about this country, people get irate. when i say i have muslim friends, one member’s parent was soooo upset with me. as a matter of fact, he was down right nasty to me. see, there’s that mindset. with that said, i’ll say that mindset is the mindset of the ‘majority’ of white evangelicals reformed or not. there is a book i read last year. ‘one nation under God’ by a professor named paul kruse (i believe). get it and read it. it was excellent. Always remember brother, God appoints leaders (Rom 13:1) but does not necessarily approve of them. There were ungodly leaders who God rose up specifically to punish or shame a nation and there were other ungodly leaders that God worked through to accomplish good for His people. We also know the Word says to be in prayer for our leaders (1 Tim 2:1), not because we just love the job they’re doing, but as David viewed Saul, they were selected by God for that position of authority for some reason. So regardless of the heart of the leader, we have to make sure we obey the Lord in this and lift up leaders. Ms Munsey, while I agree with much of your depiction of white evangelicals, I would caution you not to believe that worshiping for 7 months in a reformed church puts you in a position to generalize about all of us. I happen to know many white evangelicals in reformed churches who did not vote for or support our present president. I am disappointed that many of my friends did but they are still my friends. We can’t let politics divide us or be the determining factor in our acceptance or love of one another. I admire you for staying where you are and I hope you will be able to have an influence among hose you worship with. The white church needs to listen to the voices of those who know first hand what it is to be oppressed, marginalized and discriminated against. If we don’t listen to our black brothers and sisters and act upon what they are telling us we will never be reconciled and show the world what the Lord meant his church to be. i am black and i have been going to a protestant reformed church for 7 years. and i have come to understand the mindset of white evangelicals. they have been taught that the constitution is equal to the ‘bible’. they believe that the ‘republican party’ is the party JESUS endorses. they believe that having a job that is part of a ‘bargaining unit’ is against the word of GOD, (oh, unless you are a cop or a teacher), then GOD will allow it. so, all in all, they believe that ‘republicans’ do no wrong. they don’t believe in ‘right and wrong’ as far as politics go. they may say they don’t, but they do. they ‘strongly’ believe that loving and serving this country is equal to loving and serving the TRIUNE GOD. and it’s not. not by any stretch of the imagination. they’re mindset is just like the pharisees. but they refuse to examine their teachings against the bible. how do i survive in such a setting? by the SPIRIT of GOD. john macarthur has been a very good teacher in my walk with CHRIST. he truly loves CHRIST. and he preaches CHRIST. but his social views i don’t agree with. i compare all that he teaches next to the WORD’. simple as that. of a person truly wants to know the ‘truth’ the HOLY SPIRIT will guide them. but they must be open to things that may think aren’t (fair). 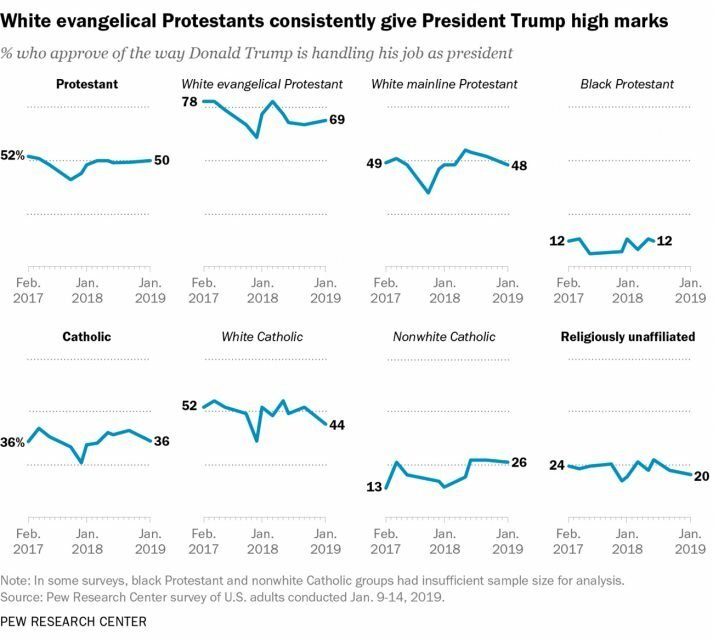 It’s also quite possible the 9% drop is due to evangelicals going back into the closet on the subject. They’re support may not have necessarily changed, just their willingness to be open about it. Considering the amount of defamation, degradation, and judgmental criticism they receive, that wouldn’t be surprising. Confirmation bias is fantastic isn’t it? Which scam, grift, or bigotry has he been charged or convicted of and on what scale is that relative the previous president or others in politics? Or for that matter, Jemar Tisby? Your bigotry against white evangelicals for who they voted for or support is judgmental and in need of repentance.